How Often Should I Reseal My Driveway in South Florida? 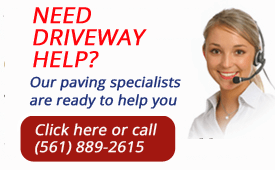 If your South Florida driveway has cracks and bumps, is looking washed out or has holes in it, chances are you are considering having your driveway repaired and resealed or even repaved. You may even be searching for a driveway pavement company like Trinity Asphalt Paving to pave a brand new driveway for your home. From Boca Raton to Lake Worth to Loxahatchee, our company is here for you! How Often Should You Seal Coat or Resurface? There are varied opinions, but with all the rain fall, the salt in the South Florida air, and the temperature hovering from 90 to over 100 degrees in the Summer, you should consider resurfacing your driveway at least every 3 years. Waiting 5 years to repairthe situation is going to result in a grayed out driveway with some cracks most likely. At Trinity Asphalt Paving, we use only the finest “Black Beauty” hot rubberized crack filler and seal coating. How Long Should I Wait to Seal My Driveway? Remember, you need to wait at least 6 months to seal a brand new asphalt pavement driveway. The asphalt needs to cure for this period prior to sealant being applied. And once your driveway has been repaired and resealed, wait at least 48 hours before you start using it again. And also remember that Trinity Asphalt Paving is a company that homeowners from Pompano Beach to Delray Beach to West Palm trust with their driveway sealing, resurfacing and paving needs. So if you are looking for a paving contractor in Boca Raton, Deerfield Beach or throughout South Florida, Trinity will be there for you! We’re at your service! Call us at (561) 889-2615 or click for a FREE QUOTE.